The Gardens at Heather Farm is a serene and stylish event venue offering six acres of gardens and grounds with commanding view of Mt. Diablo. 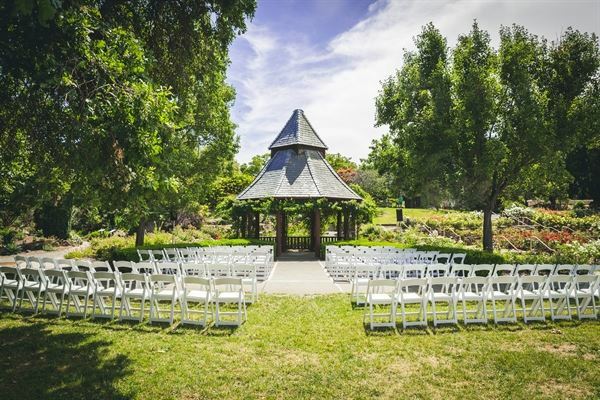 A local gem nestled alongside The City of Walnut Creek's Heather Farm Park, The Gardens is the ideal place to host your wedding, party, business or group meeting, seminar or special event. Wedding clients with a penchant for classic romance will cherish tying the knot beneath the rose-covered gazebo, surrounded by 1000 rose bushes that bloom from spring through fall. Our Patio & Pavilion complete with large, granite-topped bar makes the perfect space for a cocktail party or small, outdoor reception. And the elegant Camellia room features hardwood flooring (perfect for dancing), lofted ceiling with exposed beams, large windows and a caterer's warming kitchen. Spacious decks around the building give guests access to the outdoors. The Camellia Room also serves as a stately meeting hall, with an open floor space, neutral-colored walls and large windows that afford views of the gardens below. A large, warming kitchen and wrap-around deck provides ample amenities for catering and bar service. The room also features a projection screen and wireless Internet access. Tables and chairs can be set up in a wide variety of configurations. For workshops and seminars, breakout sessions can be held in alternate spaces. Our downstairs classroom space, the Rotary Room, is a smart choice for small meetings, training seminars and workshops. It features a large whiteboard, projection screen, and wireless Internet access, as well as a large counter space to set up coffee/tea stations and food platters. If your group is looking for some outdoor time, we have two spaces that can meet your needs. The Meadow Lawn is the perfect location for picnics and team-building activities. Lush and serene, the large, open lawn area is bordered by rose hedges and a variety of different trees. Adjacent to the Rotary Room and our Sensory Garden, the Patio & Pavilion offers a large concrete patio area and granite-topped bar which make perfect space for a social gathering and outdoor food and beverage service. We can tailor a rental package to meet the needs of your event. Please contact us and let us know how we can assist you in planning your special event. The Gardens at Heather Farm is dedicated to inspiring and educating the community about gardening and stewardship practices that preserve and protect the environment. We have six acres of gardens used in our education programs for people of all ages, but we are also a serene environment for just strolling, resting or picnicking with family and friends. We are a 501 (c)(3) non-profit and are self-supporting through memberships, fundraisers, private donations, program fees and rental facilities. Enjoy a romantic ceremony under the rose-covered Gazebo, cocktails and hors d'oeuvres at the Pavilion, and an elegant dinner followed by dancing in our banquet room. Package cost is $3,600 for ceremony and reception (10-hour block) on any available Saturday from November through March. Fees include set-up and removal of tables and chairs and an on-site building attendant for the duration of your event. Additional hours can be arranged for a fee of $200 per hour. An additional refundable security deposit of $800 is required. Additional set-up fees may apply pending on guest count and day. All catering must be done by one of our approved caterers. Full terms and conditions of this package will be outline in rental rules and contract documents to be reviewed at time of booking. Enjoy a romantic ceremony under the rose-covered Gazebo, cocktails and hors d'oeuvres at the Pavilion, and an elegant dinner followed by dancing in our banquet room. Package cost is $4,500 for ceremony and reception (10-hour block) on any available Saturday from April through October. Fees include set-up and removal of tables and chairs and an on-site building attendant for the duration of your event. Additional hours can be arranged for a fee of $200 per hour. An additional refundable security deposit of $800 is required. Additional set-up fees may apply pending on guest count and day. A high-ceiling room with a wood-grain floor and expansive views of the gardens beyond. A spacious deck wraps around two sides. Full kitchen available for caterers. Surrounded by roses, the Gazebo has a concrete apron that seats 60, and a lawn area that accomodates another 90. Electrical power is available. A large lawn area available for outdoor wedding ceremonies, receptions, lawn parties and other events for up to 150 guests. Renters must provide their own tables and chairs. A charming outdoor space, perfect for a cocktail reception. The granite countertop pavilion features running water and electricity. There are a number of built in benches for those who need to sit.